The Directors since the last Annual Meeting have also had to regret the loss by death of Mr. Martin Seymours the Manager of the Collieries, which occurred on the 18th of March last They have appointed in his place Mr. James Campbell, who is performing the duties to the entire satisfaction of the Board. The management of the business of the Company by Mr0 Markham, the Managing Director, has had a most satisfactory result, as shown by the Balance Sheet, which, with the Report, is presented herewith. 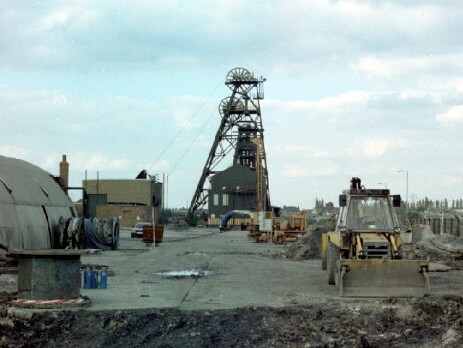 During the past year the sum of £25,353 1701 has been paid on account of the purchase of the North Staveley Collieries at Aston, but there are legal difficulties connected with the complete Transfer of this property which have not yet been finally arranged. Mr. Markham, the Managing Director, and the whole of the other Officers of the Company, have performed their respective duties in an efficient and satisfactory manner. Your Directors have endeavoured as far as practicable,, and regardless of expense, to ensure the utmost amount of safety to the workmen employed in these Works, and they have satisfaction in believing that in freedom from serious accident these Collieries will compare most favourably with the best conducted Works in the Kingdom. A portion of the sum of £1000 set apart by resolution of the last Ordinary General Meeting for religious and educational purposes, has been expended, and the whole amount will be appropriated in the way most likely to contribute to the educational improvement and well-being of the Children of the Workpeople in the employment of the Company. The agreement made by your Directors with the Mid].and Railway Company for the sale and working of the Staveley Railways has been fully carried out; and your Directors feel assured that the arrangement will be found mutually convenient and advantageous to both Companies. The Directors have pleasure in reporting that a New Lease for forty-two years has been entered into with the Duke of Devonshire on fair and equitable terms which will insure to the Staveley Company an ample supply of House and Gas Coal for the whole term. A Lease for a similar term has also been taken of the Coal, held under Archdeacon Hill. The Court of -Chancery having sanctioned the lease of the North Staveley property, and all legal difficulties being now removed, the Directors will proceed to develop the Colliery. The Directors feel especial gratification in recording their very high appreciation of the great labour and perseverance of their Managing Director, Mr. Markham, in promoting the establishment of the "Non-Union Movement" amongst the workmen employed by the Company, in opposition to the Trades' Union Associations, under which the workmen in other districts have so long suffered. Mr. Markham's conciliatory, earnest, and candid communications with the workmen, during the past year, have well deserved the confidence they have reposed in him, and your Directors believe that the Non-Union Movement will go on steadily increasing throughout the Country, and that great practical social benefits will arise there from, which will be fully appreciated by the workmen, and result in mutual advantage to both employers and employed. Your Directors will continue to contribute by every means in their power to the comfort of the workpeople, by giving the best wages to all industrious workmen, by providing them, as far as practicable, with convenient cottages, gardens, &c0, and by supporting Schools for the education of the Children, and other facilities for their intellectual and moral instruction. In conformity with these views the Directors have agreed to contribute to the Staveley Works Accident Fund the sum of £2,000 by four yearly instalments, and after that period a further sum equal to 25 per cent, of the amount subscribed by the workmen. The Directors rely upon the Shareholders confirming, by their authority, this gift and contribution. The operations of the Company have, during the past year, been conducted with considerable success, in the midst of a period of great commercial depression and uncertainty. The sinking of the "Campbell Pit" has been completed, and the Black Shale Coal reached at a depth of 240 yards. The winding engines are in a forward state, and the necessary works to open out the pit will be completed during the next twelve months. The water from some of the upper measures having found its way into the Hard Coal Pits, it became necessary to erect a powerful pumping engine at Seymour Pit. The work was one of considerable danger and difficulty, as it had to be carried on whilst the driving of coal was uninterrupted. The engine and pumps were finished in January 1868 and since then all anxiety from this cause has been removed. It has, however, been thought prudent to lay dry the whole of the hard coal field, and additional pimping engines are now being erected for that purpose. A new blast furnace has been erected, and was put in blast in September, 1867. A new blowing engine is now in course of construction, and will be completed towards the middle of next year. No expense has been spared to render the Collieries and Mines as perfect and as free from danger as the nature of such operations permits, and it is a source of great satisfaction to the Directors that works so extensive have during the past year continued to be conducted with a comparative immunity from serious accidents. A considerable amount has been expended during the past year in Fan Ventilation at the Hollingwood Collieries, which is expected to result as satisfactorily as that at the Hard Coal Pits, and it is believed that this system of ventilation will be more generally adopted. The special expenditure this year at the Seymour Pit in the erection of a new Pumping Engine, and amounting to £4,057. 17s. l1d. has been charged to the Special Suspense Account, which is consequently reduced to £19,730, 16s. 1d. The establishment of the "Accident Fund" has been attended with great benefit to the work people, who fully appreciate the advantages conferred upon them. Your Directors are convinced that a great improvement has taken place in the general education of the children of the work people during the past few years, and they feel confident that the efforts that are being made to spread knowledge and intelligence amongst them, will confer an inestimable blessing upon the labouring population of the district, and that the social condition of the people is being steadily improved. A further sum has been expended in the past year in completing the Fan Ventilation at the Hollingwood Collieries. The Machinery was set to work in May last, and the quantity of air now passing through the works is nearly double what it was formerly, and your Directors are satisfied that the expenditure incurred will very materially add to the safety of the workpeople. The new Blowing Engine, mentioned in the last Report, together with a new Furnace, have been completed, and are now working in a satisfactory manner. It was stated in the last Report that a powerful pumping engine had been erected at the Seymour Pit to pump out the water that had found its way into the Hard Coal Pits. As the workings were extended, the water increased, and your Directors ultimately decided to lay dry the whole of your Hard Coal Field. There is an immense reservoir of water in the old workings which might have forced its way through the barrier into the Hard Coal Pits, involving loss of life and destruction of property. The Directors therefore determined to sink two new pits and erect two powerful pumping engines, at an estimated cost of about £12,000. Both these works are now in the course of construction, and it is anticipated that they will be completed before June, 1870. The amount expended this year in the erection of these new Pumping Stations is £4,416. 17s. and has been charged to Special Suspense Account, which is consequently reduced to £15,313. 19s, 1d. As soon as the pits and engines are completed, the Company will be able to work away the barriers which were left for the protection of the present Collieries, and will thereby, to a certain extent, increase the duration of the Hard Coal Pits. The Coal trade is passing through a period of almost unparalleled depression. The Directors have therefore thought it desirable to carry forward a large balance, as they do not anticipate so favourable a Balance Sheet will be presented at the next Annual Meeting. The Campbell Colliery is being gradually developed, and it is expected that during the present winter a considerable amount of Coal will be raised from this Pit. The extended and increased workings of the Spring-well and Campbell Collieries will render some improved method of ventilation desirable, and upon Mr. Armstrong's advice your Directors have determined to erect one of the largest Guibal's Fans that has yet been constructed. A considerable amount of this work has been executed, and the Directors expect the Fan will be completed and set to work in the course of a few months. It was stated in the last Report that the Directors had determined to pump out the water in front of the Hard Coal Barrier, and to accomplish this object two new pits would be required, together with two powerful pumping engines. This work was estimated to cost about £l2,000 Considerable mining difficulties have been met with in sinking the Staveley Pit, and the expenses have exceeded the estimate: both engines are fixed, and the Directors anticipate that this work will be entirely completed by the middle of October. When the Company purchased the Ironworks there were only two blast furnaces, both of which had been at work many years, and were not in a satisfactory condition. One of the old furnaces had to be pulled down in December last, and has been rebuilt, and was blown in again last May. The remaining old furnace was pulled down in July, and the Directors hope to have it at work before Christmas. The Staveley Company have for a number of years been purchasers of large quantities of pig iron; and as they can manufacture pig iron as cheap as other firms, they have thought it desirable to erect two additional furnaces> the foundations of which were commenced on the 28th of June last. Your Directors are of opinion that an increased production of pig iron will be attended with profitable results, and they hope to have six furnaces in operation during the present financial year. The general trade during the past year has been depressed, and the Company have been subjected to a serious competition by the opening out of new Collieries in this immediate locality. Your Directors have signed a lease with Mr.de Rodes for the purchase of about 1,350 acres of Steam Coal in the Parish of Barlborough, upon terms which they believe to be fair and equitable to both parties. To open out and develop this property will involve a further outlay on Capital Account. Considerable difficulty has been experienced in obtaining workmen, in consequence of the deficiency of house accommodation, and your Directors have been compelled to sanction the building of additional cottages. The Coal Trade in the neighbourhood of Chesterfield has been subjected to very serious competition during the past twelve months, in consequence of the opening out of a great number of new coalfields, and it is probable that the competition will continue for several years to come. Your Directors have much cause to congratulate the Shareholders that the whole of your Collieries, with the exception of North Staveley are now ventilated by fans instead of furnaces, which has materially tended to the safety and security of the workmen. An extraordinary change has taken place in the demand for Coal and Iron, during the past six months. Your Directors are of opinion that if the present state of trade continues it must lead to great competition in the future. The Collieries, Ironworks, and Machinery have been maintained in good working order during the past year, and the whole expenditure of every description has been charged to Revenue. Your Directors congratulate the Shareholders upon the result that has been obtained in the working of the property during the past year, and they are unanimously of opinion that when trade is in a normal condition, the working of the property will continue to show satisfactory results. Your Directors have recently made an offer in conjunction with the Sheepbridge Company, for the Newstead Abbey Coal Mines, comprising about 3, 000 acres, as they did not feel themselves justified in allowing such an important Coalfield, lying so near the markets, to escape them. Your Directors have, in conjunction with the Sheepbridge Comapny, and in conformity with the resolution passed at the last Annual Meeting, obtained a Lease of the Coals under the Newstead Abbey Estate for a term of 84 years. A joint Committee of the Directors of the two Companies has been appointed to carry out the works, and develop the Colliery. Some progress has already been made, and a large quantity of material has been ordered, which will shortly be delivered, and your Directors hope that before the next Annual Meeting in 1874, they will be able to report that satisfactory progress has been made. A resolution authorizing the payment of £300 per annum to the Joint Committee of management will be submitted for your approval. The additional Furnace referred to in the last Report has been blown in and the Company have now seven Furnaces in blast. It has been intimated on several occasions that the Company had leased the Coal under the Barlbro' Estate. The works have been held in suspense for a considerable period in consequence of the slow progress that has been made in completing the Railway between Staveley and Worksop, and which will give access to this Colliery. Your Directors have reason to hope that during the next twelve months very considerable progress will be made in this Sinking, as the surface railways adjoining the pits are nearly completed, and three temporary engines fixed, and sinking operations have now commenced. With a view of maintaining the output of coal, your Directors have determined to sink two new pits to the Blackshale Coal, near to the main line of the Midland Railway, and within about half-a-mile of the Staveley Station. The Collieries, Works, and Machinery have been maintained in good working order during the past year. Your Directors contemplate that it will be necessary to expend a very large sum during the next three or four years on the new sinkings at Newstead, Barlbro', and Staveley, and they consider it essential for the interests of the Company to carry to a special Reserve Fund the large amount that is shown in the accounts to provide for this special expenditure. Your Directors, in conjunction with the Sheepbridge Company, have completed the preliminary work for establishing the new Colliery at Newstead referred to in the last Report. Two pits have been sunk through the water, which has been nearly tubbed off, and there is now every reason to believe that the sinking operations will be continued rapidly, as no further mining difficulties are apprehended. Satisfactory progress has been made with the two pits that are being sunk into the Hard coal at Barlborough. The sidings and some of the Works in connection with the Midland Railway are nearly completed, and there is little doubt the coal will be reached in both the pits before next June. With a view of maintaining the present output of House coal, preliminary arrangements have been made for sinking the new pit at Staveley, mentioned in the last report, which will ultimately be connected with two of the existing collieries. The pit, when completed, will be about 370 yards in depth. Your Directors, after mature consideration, determined to construct another Blast Furnace and Blowing Engine, which are now in course of erection, and which they hope will be completed by the end of the present year. The Company will then possess eight Blast Furnaces. The whole of the Company's Works, Machinery, and Plant, have been efficiently maintained. The anticipations expressed by your Directors in the last three Annual Reports, that the extraordinary development of the Coal trade would ultimately lead to severe competition in the future, are gradually being confirmed. Notwithstanding the inevitable competition that your Company will be subjected to for many years to come, your Directors reiterate the opinion they previously expressed that you possess a property of very considerable value, which they believe will in the future show as favourable results as any similar undertaking in the country. The satisfactory financial results of the past twelve months have been due in a great measure, to the very favourable contracts which the Company had taken previous to June, 1874, and the sources of income outside the ordinary businesses of the Company that the Shareholders now possess. The Barlborough sinking referred to in the last Report is now completed the Coal having been reached in both shafts. The permanent engines are fixed, but there will still be a considerable outlay required for the opening out and development of the Colliery. Your Directors have pleasure in expressing their opinion that this property will ultimately prove of considerable advantage to the permanent interests of the Company, as it will be the means of insuring a supply of Hard Coal for the Furnaces after the old Hard Coal pits in the Parish of Staveley have been exhausted. The Ireland sinking into the deep soft or Hollingwood bed at Staveley has been proceeded with, but considerable mining difficulties were met with the early progress of the works, which materially delayed the sinking. The tubbing has been carried down from the surface to a depth of about 141 yards, and the whole of the water tubbed back, and no further difficulties are now anticipated. Your Directors, in conjunction with various coal owners in South Yorkshire and North Derbyshire, have formed an association for the mutual protection and insurance of their property against strikes, and it is the intention of the Directors to propose a resolution at the General Meeting to confirm their action in the matter. Your Directors have purchased the Lease of a field of Ironstone in Lincolnshire, which will enable them to obtain an ample supply of that description of Ironstone, for their own consumption, for upwards of a quarter of a century. Debentures amounting to £44,500 fall due in the early part of the next year, and it is the intention of your Directors to redeem then. Satisfactory progress has been made with the sinking of the Newstead Colliery, the joint property of the Staveley and Sheepbridge Companies. The profits obtained during the past year are due, in a great measure, to the very favourable contracts which remained unexecuted at the commencement of the financial year. A serious mining difficulty has been met with at the North Staveley Colliery by a fault which has thrown the coal down about 120 yards. The coal leased by the Staveley Company is divided by the fault into two nearly equal portions, and if the coal beyond the fault is worked by the Company it will probably necessitate the construction of an entirely new plant. The Company have power to abandon the lease and its obligations at the expiration of about seven years from the present time. The new winning into the hard coal at Barlbro, which has been referred to on several occasions, is practically completed, and the Colliery is now being opened out and developed, and it will ensure an ample supply of coal for the furnaces for many years to come. The Ireland sinking has been completed, the winding engines are being fixed, and it is hoped in the course of another 12 months the pit will be in full operation. A new shaft has been sunk into the house coal seam near to the Campbell Colliery in substitution of the old Hollingwood shaft adjoining the Iron Works, which will tend to economise the cost of production until the whole of the coal in connection with that pit is exhausted. The whole of the works and machinery has been maintained in good working order. With a view of securing the increased safety of the workmen, duplicate fans are being constructed for use at the Collieries, one of which will be completed in the course of a few months. Your Directors regret that Mr. Campbell, who was appointed Colliery Viewer in 1865, has found it necessary from failing health and increasing years, to resign the very responsible duties that were entrusted to him, and which he fulfilled with remarkable zeal and fidelity. The Coal has been reached in both shafts at Newstead. The permanent engines are being fixed, and the works are being gradually opened out. Various difficulties have been met with in connection with this enterprise, but they have been gradually overcome, and the colliery will now be rapidly developed. The Barlborough Colliery has been in operation during the past 12 months, and is being gradually developed, but in consequence of the depressed state of the Coal trade the amount of Coal raised has not been large. From similar causes the work in connection with the Ireland sinking has not been pressed forward; the whole of the work in connection with the Ireland pit is now, however, nearly completed, and in the course of a few months the Colliery will be in full work, and in substitution of the new Hollingwood Colliery with which it is connected underground. The works in connection with the Newstead Sinking will shortly be completed, and the Colliery will, in the course of a few months, be in a position to turn out a considerable amount of Coal. due and been paid off during the last year. The whole of the Works and Machinery have been maintained in good working order. Notwithstanding the great depression and competition in the Coal Trade which has existed during the past twelve months, your Directors regret to state that the result of the contracts which have been made for the ensuing year must materially reduce the profits for the current year but they are of opinion that when trade revives the Staveley Company will be in a position to reap the benefit of more prosperous times, and that the Works will continue to show satisfactory results as compared with similar undertakings. With a view to improve the ventilation of the Ireland and New Hollingwood Collieries, and to render the Works more secure from the irruption of Water, it has been determined to sink a new shaft at New Hollingwood with powerful pumping machinery and ventilating fans, the cost of which will be defrayed out of the Reserve Fund. It was stated in the last Report that it had been determined to sink a new Shaft at New Hollingwood for the purpose of improving the ventilation of the Hollingwood and Ireland Collieries. The Shaft has been sunk and completed, and the necessary works for a new Fan and heavy Pumping Machinery are in course of construction, and it is intended to complete the whole of these works during the current financial year. Your Directors, in conjunction with the Sheepbridge Company, have converted their joint interest in the Newstead Colliery into a Limited Liability Company, each Company possessing an equal number of the Shares. A Resolution on this subject will be submitted to the Shareholders for their approval. The expenditure on this Colliery has been large in consequence of the works having been executed in a time of high prices and dear labour. The works in connection with the property will be practically completed during the present year and your Directors believe that when trade revives a fair return will be received for the outlay. The Barlborough Colliery is now completed and a very large quantity of Coal can be raised from it when trade revives. The Ireland Colliery has also been completed and is at work in substitution of the new Hollingwood Pit, and the Company is now in a position to raise a much larger quantity of Coal than at any time since its formation. The whole of the amount expended on New Works during the past year has been defrayed out of the Reserve Fund. The excessive competition in Coal and iron has continued and has led to a further reduction in their value and the contracts for the ensuing year have been taken at lower rates than those of the previous year. It was anticipated in the last Report that the new Fan and Heavy Pumping Machinery at New Hollingwood would be finished during the past financial year, but the works were delayed in consequence of a deplorable accident, involving the loss of the lives of four workmen. The Ventilating Fan has been finished, and has been at work for several months. The large Pumping Engine will be completed before the end of the year, and when it is set to work it will lead to the abandonment of four small pumping stations, as the whole of the water in connection with the deep soft coal will then be concentrated and pumped at the New Hollingwood Pit. It was thought desirable to prove the Blackshale coal at New Hollingwood, and a new pit has been sunk into the seam, which was reached in July, at a depth from the surface of 390 yards. It is intended to continue the sinking of the old shaft at New Hollingwood into the Blackshale, and connect it with the new shaft, with a view of developing a very extensive coal field, that will probably last far beyond the present term of the lease, and thereby enable the Company to fully maintain its get of coal. The Collieries and Ironworks have been maintained in good working order. The works in connection with the Newstead Colliery are practically completeds and a considerable quantity of coal is now being raised. Notwithstanding the large expenditure that has been incurred, your Directors have reason to believe it will produce satisfactory commercial results over a series of years. The operations of the Company have of late years been considerably extended. They derive special advantages from being the owners of upwards of two thousand Railway Wagons, and other properties, which combined with their Ironstone Mines and Sand Quarries in various counties have contributed to the present satisfactory financial results. The excessive competition in the Coal and Iron trades has continued with unabated severity, and the Coal trade is now in a deeper state of depression than it has been for many years. The old pair of Blowing Engines connected with the Blast Furnaces are unsuited for the heavy pressure of blast that is now adopted, and your Directors determined to replace them with a pair of Engines of greater power and capacity, and it is anticipated that the New Engines will be completed and set to work next month. The sinking at New Hollingwood into the Blackshale Seam has been completed^ and a connection formed with the new shaft. It is hoped that the Head Gear and Screens in connection with this Pit, which will be called the Hartington Colliery, will be completed before the end of the year. This Colliery will enable the Company to fully maintain their production of House and Gas Coal. During the past year some Coke Ovens have been erected for the purpose of converting the waste small coal into Coke. The Newstead Colliery is in full working order, and the results have on the whole been satisfactory to the Directors. During the past year there has been expended on New Works £19,07l. 10s0 4d., the whole of which has been deducted from the Reserve Fund, which now stands at £43,233. 18s. 0d. During the past financial year, the competition in the Coal and Iron trades has continued with unabated severity, but considering all the circumstances, the Directors are of opinion that the financial results of the year's working are highly satisfactory. With a view of securing a further independent supply of Iron Ore, the Company have entered into arrangements, in conjunction with the Bestwood Company, for the joint lease of an Ironstone field belonging to his Grace the Duke of Rutland, at Eastwell, in Rutlandshire. A tram road has been constructed from the public Railway into the Ironstone field, and the Staveley Company are now obtaining a portion of their supply of Iron Ore from that source. The Hartington Colliery has nearly been completed. The expenditure on this Colliery, together with the new Coke ovens and the cost of opening out the Eastwell Iron Ore Mines, has been debited to the Reserve Fund, which it will be remembered was set aside for such purposes. When the Company was formed, an obligation was taken over from the late Mr. Richard Barrow for the daily supply of a large quantity of small Coal to the late Mr. James Morrison, which was converted by him into Coke on the Staveley Property. The Lease would have expired on the 31st December, 1881, but arrangements have been made with the Executors by which the Lease was terminated on the 1st June, and the Company are now manufacturing a considerable quantity of coke. The Collieries, Ironworks, and all the Property of the Company have been maintained in good working order. Excessive competition has continued during the past year in the Coal and Iron trades of this locality. Your Directors have arranged to lease for sixty-three years the Coal in the Button and Duckmanton Estates, adjoining Staveley Parish, the property of W. Arkwright, Esq,, containing a surface of upwards of 5,000 acres. The terms of the lease have been approved by the Court of Chancery, and the Company, having obtained possession, have made a Railway to the site of the proposed pits, and are making the necessary preliminary arrangements for sinking a pair of shafts into the Top Hard coal. It is intended to press this work forward with the utmost vigour. with the Bestwood Company, had secured a lease of an Ironstone field belonging to His Grace the Duke of Rutland, in the Parish of Eastwell. The Works have been vigorously pushed forward, and a considerable quantity of Stone has been used from these mines during the last year in the Staveley furnaces. Your Directors have, jointly with Messrs. Oakes & Co., made arrangements for leasing a further quantity of Stone of a different description, belonging to His Grace the Duke of Rutland, in the Parish of Waltham, and they hope that when the whole of the mines the Company own, and are interested in are fully developed, they will be able to obtain from these sources the whole of their supply of Ironstone for smelting purposes. During the past financial year severe competition has continued to exist in the various departments of the Coal and Iron Trades. It was intimated in the last Report that the Directors had taken a lease of the Coal under the Button and Duckmanton Estates belonging to Mr. Arkwright. The Lease was granted on the 1st July 1882, and since that period the most strenuous efforts have been made to establish a Colliery on the Estate, and the Directors have pleasure in stating that the Works in connection with the sinking have progressed in a very satisfactory manner, and it anticipated the Coal will be reached in one of the Shafts early in October. and it is hoped that before the next General Annual Meeting the Pit will be in a position to turn out a fair quantity of Coal. The Directors have to announce that they have leased from his Grace the Duke of Portland, a piece of Coal in close proximity to their Old Seymour Pit in the Parish of Staveley, and they have during the past six months been working a portion of this Coal through the Seymour Shaft. and Rutlandshire, and it will be satisfactory to the Shareholders to know that at the present time, the whole of the Ironstone used in the Staveley Furnaces is obtained from these Mines. The Collieries and Ironworks have been maintained in good working order, and in the event of more prosperous times, the Company will be in a position to do a largely increased volume of trade. The Directors of the Newstead Colliery Company, with a view of providing for the increasing trade, have ordered Engines and the necessary Plant and Machinery to enable them to draw Coal through the upcast shaft, and the work is now in a forward state. The new sinking into the Button Estate has now been completed. The Shafts are 310 yards deep, and the whole of the Plant, Machinery, and Sidings have been finished in a most substantial manner. This important work has been pushed forward with the utmost vigour and success, and nearly 30O tons of Coal per day are now being drawn from this Estate. The Sutton Hard Coal will be worked in substitution of the North Staveley Coal. It was intimated in the Report of 1876 that a serious Mining difficulty had been met with at North Staveley, and your Directors, after giving much consideration to the subject, determined to avail themselves of a clause in the Lease to surrender the Colliery, which they did in May last. The New Colliery on the Sutton Estate will in a short time be in a position to turn out a larger quantity of Coal than was possible from the North Staveley Pit, and of a better quality. The whole of the Ironstone used in the Furnaces during the past year has been obtained at cost price, from Mines of which the Staveley Company are Part Proprietors. The New Colliery on the Sutton Estate is now in full operation. In opening out this Colliery some unexpected faults were met with, which, however, have been passed through, and the quality of the Coal is similar to what was anticipated when the lease was taken. In fulfilment of the obligations of the Sutton lease, arrangements have been made for sinking a pair of shafts, which will be 500 yard in depth, into the deep soft coal. Most of the preliminary work has been executed during the past half year, and active sinking operations will be commenced this month. Notwithstanding the extremely low prices that have prevailed during the past financial year, the results have not been unsatisfactory, which is attributable to the large and favourable contracts that were entered into before the commencement of the financial year. It is a source of much satisfaction to the Directors that they have been able in these depressed times to find employment for the large number of workmen who have been connected with the Company for many years past. At no period in the history of the Company have so low prices prevailed as now exist, and the difficulties that are now being passed through are a source of anxiety and embarrassment to everybody connected with the coal and iron industries. The new sinking to the Deep Soft Coal on the Sutton estate, which was referred to in the last report, has been continuously carried on during the past year. It is anticipated that the coal will be reached before the end of December, but it will then take fully twelve months to open out and develop the pit. The Directors regret to say there has been no mitigation of the depression that has so long prevailed in the Coal and Iron trades. The new Markham Sinking into the Deep 8oft Coal on the Sutton Estate referred to in the two preceding Annual Reports, has now been completed. Some faults similar to those met with in the No,1 Pit have been passed through and although they are not of a serious nature they will cause some delay in the development of the Colliery and getting the coal into the market as early as had been anticipated. The machinery and sidings are in a forward state and the work will be proceeded with as quickly as possible. The great depression in the coal and iron trade has continued in unabated severity and prices are practically the same as they were 12 months ago, but your directors have to report an increased business in every department of the Company's operations. There are now six furnaces in blast, and two are being rebuilt, one of which will be completed in November, and the other early next year the Company will then be able to increase their operations in the pig iron and castings departments. In the present state of the Coal and Iron Trade, a satisfactory Dividend can only be relied upon by extensive operations and the exercise of the greatest economy in every department. Your Directors very deeply regret having to report the continued and very severe illness of their Managing Director, Mr. Markham. They have further to report the death of a much-valued colleague, Mr. Thomas Vickers, which occurred in November last. Having reference to the active part taken in the Works by Mr. Charles Paxton Markham, the Directors unanimously appointed him to the vacant seat at the Board with the full consent of Mr. Charles Markham. Your Directors are glad to report that the great depression in the Coal and Iron trade which has existed for so long a period has partly abated, and there is a better demand for both iron and coal excepting house coal, which still remains at nearly its old price. The workmen, in consequence of this improvement, made immediate demands upon the Company for an increase of wages. To a considerable extent these demands were made whilst the Company's old contracts for both iron and coal were running, which put for the time being an unjustifiable pressure on the Company. It is, however, satisfactory that the wages question was settled without any strikes, which are so disastrous to both masters and men. During the past year considerable improvements have been made in the Furnace plant, and the Company will shortly have eight furnaces in blast, which are capable of doing good and economical work. The Manchester, Sheffield, and Lincolnshire Railway Company have obtained an Act for extending their line from Heighten Junction to Newstead, and forward to Nottingham. That Act carried with it ample running powers to the London and North Western, and the Great Northern Railway Companies, and must result largely to the benefit of the Staveley Company, as it will connect the works with four great Railway Systems. Mr. Markham's death, which happened after the last Annual Report was issued, was a great blow and source of much pain to every Director. Mr. Markham had been very intimately mixed up with all the operations of the Company since its formation; he gave his entire services for the benefit of the Company, and the arrangements he made for the extension of its operations were always judicious and resulted in benefit to the Company. The effect of his labours will be felt beneficially as long as the Company exists. Since the last Annual Meeting the Directors, by a unanimous vote, appointed Mr. George Bond their General Manager. The Directors have reason to be fully satisfied with their recent appointments, the concern being worked with the greatest harmony and co-operation of the officials, the results of which are certain to be found in future Balance Sheets. Good progress has been made with the erection of the Workmen's cottages referred to in the Reports of 1890 and 1891. 129 cottages at Poolsbrook are now inhabited, and the whole of the 200 to be built there will, it is anticipated, be finished and occupied before winter. The Manchester, Sheffield and Lincolnshire Railway Company's connection with the Ironworks was opened for Minerals and Goods traffic on the 1st December 1891. That Railway Company has also formed a connection with the Markham Collieries, and it is hoped that in a short time they will have access to the Ireland and Hartington Collieries. by its connection with this Ironstone Company. The whole of the Plant and Machinery has been maintained in thoroughly good condition and working order. The Directors, after giving the gravest consideration to the question of maintaining the future supplies of coal, have entered into negotiations to lease a large area of hard coal, which they feel confident will be for the future benefit of the Company.